Maine Lobster, melted butter and fresh corn - a winning combination. Immersed in the unmistakable beauty of Perkins Cove in the picturesque town of Ogunquit, Maine. Smokin' hot steamers, broth and of course, butter! The Special - Our signature sandwich, always fresh and full, a quarter pound of famous Maine lobster meat on a toasted bun, with or without mayo and a hot chowder with oyster crackers. Premium hand-picked Maine crab meat served up on a toasted bun completes our Crab Cake Sandwich. We are now open for the 2018 season! The “Shack” has been owned and operated by the Evans family since the 1980s. We offer an intimate, yet rustic setting for your dining pleasure. We invite you to come and receive the full Maine experience, courtesy of Jason, his family, and his crew. 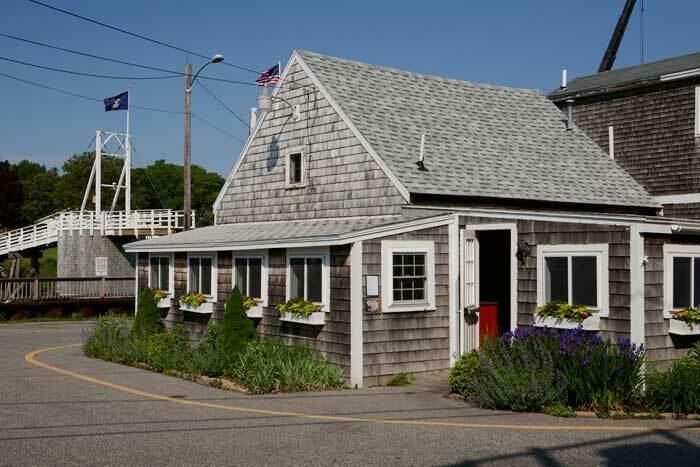 Enjoy lobster, steamers, lobster rolls, chowder, and a whole lot more in a friendly, casual atmosphere. Live lobsters are caught by local lobstermen and wait in tanks filled with ocean water pumped straight from Perkins Cove in Ogunquit, Maine. For all the taste without the work, have a lobster roll any way you like it; a quarter pound single, double stuffed, triple, or an entire pound on a buttery toasted roll with or without mayo. The lobster wrap and lobster BLT are new favorites. Our traditional, homemade New England chowder made from an old family recipe is a great way to start your meal. There’s no thickening flour, just the perfect combination of clams, haddock, potatoes, onions and spices in a milk and cream base. The Lobster Shack serves fresh lobster, haddock, chowder and more at the edge of Ogunquit in Perkins Cove.